The instructors at the Seattle Ki Society are all highly-trained, experienced, and friendly people, who have a sincere and genuine interest in teaching and sharing their knowledge. Several have received awards and honors at the competition at the Headquarters dojo in Japan, and all are available to answer any questions you may have about aikido or our school. Grigsby Sensei holds a 6th degree black belt ('rokudan') in Ki-Aikido, a Joden in Ki Development, and is a certified Assistant Ki Lecturer. Grigsby sensei began her aikido training in 1988 at the Headquarters dojo in Tokyo, where she trained for 5 years under the top instructors in Ki Society, including Tohei Sensei. The focus of her training was in the Aikido Gakuin, a special two-year aikido school that offered an intensive program to foreigners. She completed the program and trained an additional year as a ‘graduate’ student. In 1991 and 1993, she participated in the All Japan Taigi Competition, receiving a gold medal both times. She currently lives in Olympia, but travels regularly to Seattle to teach and train with us at the Seattle Ki Aikido dojo. She hopes to also begin teaching in the Olympia area in the near future. Dan Duyungan Sensei holds a 2nd degree black belt ('nidan') rank in Ki-Aikido, a Shoden in Ki Development, and has been training since 1997. "I've had a lifelong interest in martial arts. A friend gave me criteria to look for when checking out local classes. As soon as I walked in the door at the Seattle Ki Society, I knew that it offered everything I'd been looking for. The people there are like family. I value the authentic Japanese teaching styles they offer. " "Being the head instructor of the children's program gives me the opportunity to pass along my knowledge. It's very rewarding when you can see just by the look on a child's face that they really understand a technique I've taught them." "I work in a fast paced atmosphere that can get pretty stressful through the day. I use aikido techniques to relax when necessary, which helps me focus and re-energize after a long day." 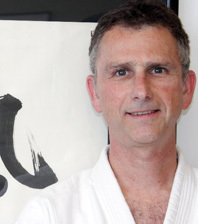 Paul Schoenfeld Sensei holds a 2nd degree black belt ('nidan') in Ki-Aikido, a Shoden in Ki Development, and has been training since 1998. Schoenfeld Sensei began his training in 1974 in San Francisco, where his graduate school offered a class. He practiced there for three years. He took a 23 year break to raise his two daughters, and returned to his practice in 1998. During his hiatus, he regularly practiced ki breathing and meditation, as well as tai chi chuan. On using aikido in his daily life, Schoenfeld Sensei says, "I run a 15 person department in a busy medical group, and I have the opportunity to find peace in situations of conflict on a daily basis. I love the feeling of being filled and surrounded by ki. Training at the Seattle Ki Society is special. All the instructors are truly inspiring. Each one has something unique to impart." Sam Corpus Sensei holds a 2nd degree black belt ('nidan') in Ki-Aikido, a Shoden in Ki Development, and has been training since 1994. She began training after being temporarily laid off from work. She wanted to keep busy and not dwell on her misfortune, and saw our aikido class in the Experimental College catalog. She also knew a coworker who was teaching aikido and he encouraged her to try it. Once she started she found it a challange in a positive way. Family obligations required her fulltime attention, so she took some time off from regular practice. Returning in 2005, she was happy to be back on the mat. Though feeling a little rusty at first, it wasn't long before the movements felt familiar again and the cobwebs were dusted off. She refocused her training to prepare herself for her black belt test, achieving it in the summer of 2006. "Working in the healthcare environment can often times be stressful, so I rely on the ki training to calm myself or simply go with the flow as opposed to colliding with others." She also rarely missed any of the parties at Steve Li sensei's house. Hezy Shuhendler Sensei holds a 1st degree black belt (Shodan), a Jokyu in Ki Development and has been training since 2001. Hezy was introduced to Aikido by a friend who in addition to demonstrating some techniques, also followed with a brief discussion about the philosophy and principals of Aikido. He had realized and found out that the dynamic flow of Aikido motion coexists in a harmony with the principle of non-dissent and was hooked…he also still remembers the feeling of this Nikyo technique. A short time later, after moving to Seattle, he joined the dojo. “Whether working as a CPA in a fast pace environment and often navigating between deadlines or spending time with family and friends, learning and applying Aikido and Ki principals in daily life is an enjoyable life-long experience”. Shuhendler Sensei is teaching the Thursday evening class. 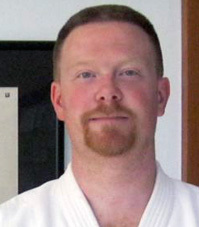 Randy Ogryzek holds a 1st degree black belt ('shodan') rank in Ki-Aikido, a Jokyu in Ki Development and has been training since 2003. Randy was briefly introduced to aikido while in college and the experience stayed with him for more than 10 years. Once he began training he quickly began to understand how the ki-aikido philosophy provides benefits to life in general, not just "on the mat". Working in an operations role in a large IT company provides Randy many opportunities to practice ki extension in daily life. "I am often pleasantly surprised at the difference than can be made in a meeting or conversation by applying Tohei Sensei's ki principles. By working to create harmony rather than conflict the outcomes are much more satisfying for both parties."